Flipper coil plunger & bakelite link as used on late Bally electro-mechanical (EM) and early solid-state (SS) games from October 1975 (Hi-Deal) through March 1980 (Space Invaders). Also replaces Bally # A-3714-1. Use with flipper crank # A-3711-2 (left) or A-3711-3 (right). Measures 2-5/8 inches overall length. 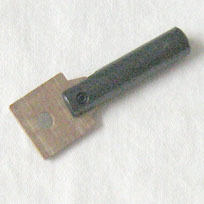 Bakelite link measures 1-1/8 inch long, 7/8 inches wide, 1/8 inch thick. Small hole (for roll pin) is 1/8 inch diameter. Large hole is 7/32 inch diameter. 9/16 inch between holes, center-to-center. IMPORTANT NOTE: If using this part with a new flipper crank (our # A-3711-2 (left) or A-3711-3 (right)), then the large hole in the bakelite link will have to be drilled-out larger to 9/32-inch diameter to accomodate the larger stud on the A-3711-x crank (larger stud is used on the new aftermarket replacement cranks).